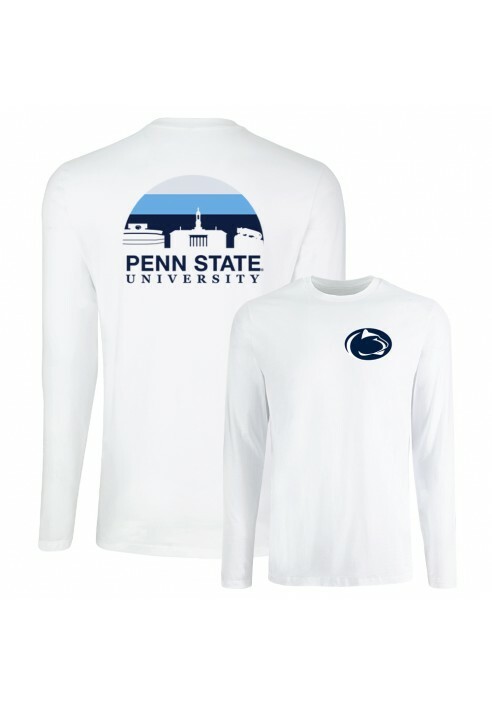 • Men's Penn State Longsleeve Tee by UScape. • Available in White & Dark Gray. • Front: Nittany Lion Logo printed on left chest. • Back: Tri-colored (three shades of blue) half-circle graphic with negative space silhouettes of Bryce Jordan Center, Old Main, & the Nittany Lion Shrine with Navy detailing. • "Penn State University" printed below graphic in Navy.